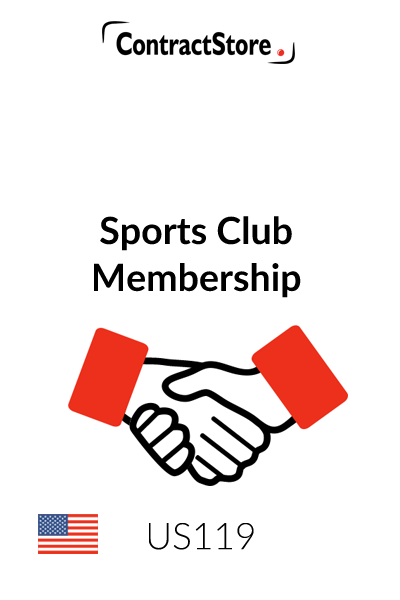 This club membership agreement is designed to provide terms and rules of membership of a sports club. It contains a customisable (“fill-in-the-blanks”) cover page and a comprehensive set of terms and conditions that can either be attached to the cover page or set forth on the reverse side of the membership form. This form is intended for use in any state in the United States, and is for use when you want to set out comprehensive terms and rules of membership of a sports club. 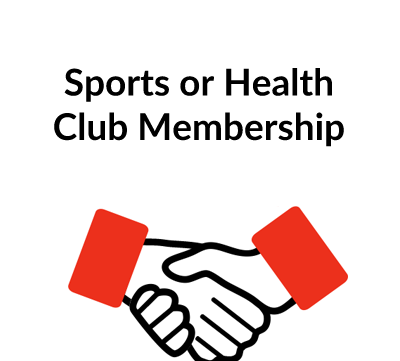 This form of Club Membership Agreement is designed to provide terms and rules of membership of a sports club. It contains a customizable (“fill-in-the-blanks”) cover page and a comprehensive set of terms and conditions that can either be attached to the cover page or set forth on the reverse side thereof. This form is intended for use within the United States. However, as is the case with any agreement for use in the United States, regard must be had for the possibility of variations in the laws from state to state. 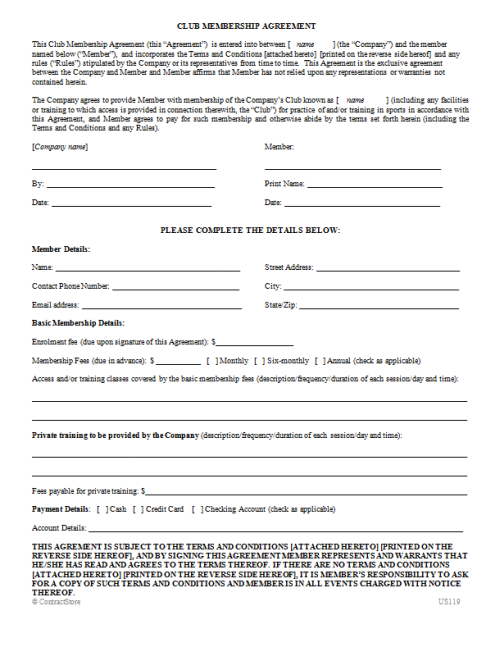 This form provides a good starting point for preparing a first draft of a Club Membership Agreement. However, as with use of any form, it is very important to take the time to read the form in its entirety to ensure that it is customized appropriately for use in your individual situation. For all but the simplest of transactions, it can be anticipated that some customization will be in order; and as mentioned above, it may also be advisable to consult with competent legal counsel and/or tax advisors. 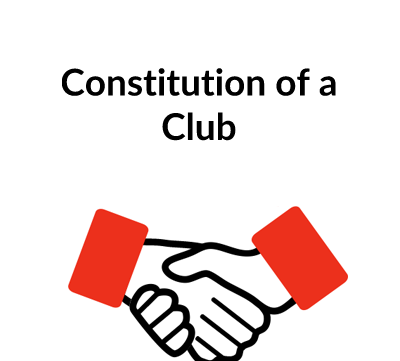 The Club’s company and business names should be inserted at the beginning of the document. This form presumes that the Agreement will be signed by the Club that is organized as a corporation, but if some other type of entity is used, then the language should be modified accordingly. Depending on whether the terms and conditions are attached to the Agreement as a separate document or on the reverse side, the references to “[attached hereto] [printed on the reverse side hereof]” should be edited accordingly. Most of the information on the front side is intended to be filled in at the time that a member applies for membership of the Club. The terms and conditions are set up either to be attached to the Agreement as a separate document or to be set forth on the reverse side. If used without modification, they can be set forth on the reverse side by shrinking the font size to approximately 8 points (see example set out in columns). The terms and conditions cover a wide variety of common terms, including use of the club, training, fees, cancellation/termination of membership, limitation of liability, assignment and choice of law and dispute resolution. The only term that will require completion is the choice of law and dispute resolution provision, which should be completed with the location of the Club.